Brandin Cooks showed up, did his job well and is now off on another adventure. As of Tuesday afternoon, the 24-year-old wide receiver is no longer a New England Patriot. He will be donning a Los Angeles Rams’ jersey next year. 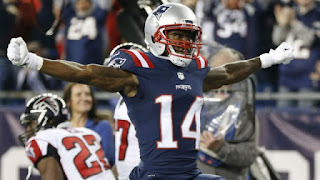 In a year that New England was without offensive weapons Julian Edelman, Malcolm Mitchell and Chris Hogan (for a while), Brandin Cooks showed up in a big way to help out his team. He played in all 16 games, made 65 catches, had 1,082 receiving yards and seven touchdowns. He also caught ten passes for 155 yards in the playoffs. Yes, “Cookie” was good to the Patriots. But with Edelman, Mitchell, Hogan, Rob Gronkowski and company, New England will be just fine.